When I first began reading through the Bible I looked for some unifying themes. I concluded that there are many, and that if we make one theme the theme (such as “covenant” or “kingdom”), we run the danger of reductionism. However, one of the main ways to read the Bible is as the ages-long struggle between true faith and idolatry. In the beginning, human beings were made to worship and serve God, and to rule over all created things in Godʼs name (Gen. 1:26­–28). Paul understands humanityʼs original sin as an act of idolatry: “They exchanged the glory of the immortal God . . . and worshiped and served created things rather than the Creator” (Rom. 1:21–25). Instead of living for God, we began to live for ourselves, or for our work, or for material goods. We reversed the original intended order. And when we began to worship and serve created things, paradoxically, the created things came to rule over us. Instead of being Godʼs viceregents, ruling over creation, creation now masters us. We are subject to decay and disease and disaster. The final proof of this is death itself. We live for our own glory by toiling in the dust, but eventually we return to the dust—the dust “wins” (Gen. 3:17–19). We live to make a name for ourselves, but our names are forgotten. Here in the beginning of the Bible we learn that idolatry means slavery and death. 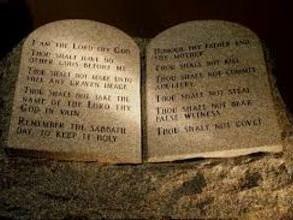 The Ten Commandments’ first two and most basic laws (one-fifth of God’s law to humanity) are against idolatry. Exodus doesn’t envision any third option between true faith and idolatry. We will either worship the uncreated God, or we will worship some created thing (an idol). There is no possibility of our worshiping nothing. We will either worship the uncreated God, or we will worship some created thing (an idol). There is no possibility of our worshiping nothing. Whatever we worship we will serve, for worship and service are always inextricably bound together. We are “covenantal” beings. We enter into covenant service with whatever most captures our imagination and heart. It ensnares us. So every human personality, community, thought form, and culture will be based on some ultimate concern or some ultimate allegiance—either to God or to some God-substitute. Individually, we will ultimately look either to God or to success, romance, family, status, popularity, beauty, or something else to make us feel personally significant and secure, and to guide our choices. Culturally, we will ultimately look to either God or to the free market, the state, the elites, the will of the people, science and technology, military might, human reason, racial pride, or something else to make us corporately significant and secure, and to guide our choices. Here Luther says failure to believe God accepts us fully in Christ—and to look to something else for our salvation—is a failure to keep the first commandment; namely, having no other gods before him. To try to earn your own salvation through works-righteousness is breaking the first commandment. Again, he says we cannot truly keep any of the other laws unless we keep the first law—against idolatry and works-righteousness. Thus beneath any particular sin is this sin of rejecting Christ-salvation and indulging in self-salvation. Beneath any particular sin is this sin of rejecting Christ-salvation and indulging in self-salvation. The Bible, then, does not consider idolatry to be one sin among many. Rather, all our failures to trust God wholly or to live rightly are, at root, idolatry—something we make more important than God. There is always a reason for a sin. Under our sins are idolatrous desires. Scripture’s teaching about idolatry is particularly helpful for evangelism in a postmodern context. The typical way Christians define sin is to say that it is breaking Godʼs law. Properly explained, of course, that’s a good and sufficient definition. But the law of God includes both sins of omission and also of commission, and it includes attitudes of the heart as well as behavior. Those wrong attitudes and motivations are usually inordinate desires—forms of idolatry. Yet when most listeners hear us define sin as “breaking Godʼs law,” all the emphasis in their minds falls on the negative (sins of commission) and on the external (behaviors rather than attitudes). There are significant reasons, then, that “lawbreaking” isnʼt the best way to first describe sin to postmodern listeners. First, this definition of sin includes a group of people postmodern people are acutely aware of. Postmodern people rightly believe much harm has been done by self-righteous religious people. If we say “sin is breaking Godʼs law” without a great deal of further explanation, it appears the Pharisaical people they have known are “in,” and most other people are “out.” Pharisees, of course, are quite fastidious in their keeping of the moral law, and therefore (to the hearer) they seem to be the essence of what a Christian should be. An emphasis on idolatry avoids this problem. As Luther points out, the Pharisees, while not bowing to literal idols, were looking to themselves and their moral goodness for their justification, and therefore they were actually breaking the first commandment. Their morality was self-justifying motivation and therefore spiritually pathological. At the bottom of all their lawkeeping, they were actually breaking the most fundamental law of all. When we define and describe sin to postmodern people, we must do so in a way that challenges not only prostitutes, but also Pharisees, to change. When we define and describe sin to postmodern people, we must do so in a way that challenges not only prostitutes, but also Pharisees. There’s another reason we need a better explanation of sin for postmodern people. They are relativists, and the moment you say, “Sin is breaking Godʼs moral standards,” they will retort, “Well, who is to say whose moral standards are right? Everyone has different ones! What makes Christians think theirs are the only right set?” The usual way to respond is to become sidetracked from your presentation of sin and grace into an apologetic discussion about relativism. Of course, postmodern people must be strongly challenged about their mushy view of truth, but I think there is a way to move forward and actually make a credible and convicting gospel presentation before you get into the apologetic issues. I do it this way: I take a page from Kierkegaardʼs The Sickness unto Death, and I define sin as building your identity—your self-worth and happiness—on anything other than God. Instead of telling them they’re sinning because they’re sleeping with their girlfriends or boyfriends, I tell them that they’re sinning because they’re looking to their careers and romances to save them, to give them everything they should be looking for in God. Such idolatry leads to drivenness, addictions, severe anxiety, obsessiveness, envy of others, and resentment. I’ve found when you describe their lives in terms of idolatry, postmodern people do not offer much resistance. They doubt there is any real alternative, but they admit sheepishly this is what they are doing. I’ve also found this makes sin more personal. Making an idol out of something means giving it the love you should be giving your Creator and Sustainer. To depict sin as not only a violation of law, but also of love, is more compelling. Of course a complete description of sin and grace includes recognition of our rebellion against Godʼs authority. But Iʼve found that if people become convicted about their sin as idolatry and mis-directed love, it’s easier to show them that one of the effects of sin is to put them into denial about their hostility to God. In some ways, idolatry is like addiction writ large. We are ensnared by our spiritual idols, just like people are ensnared by drink and drugs. We live in denial of how much we are rebelling against Godʼs rule, just like addicts live in denial of how much they are trampling on their families and loved ones. In some ways, idolatry is like addiction writ large. The biblical theme of idolatry has far more implications for ministry in a postmodern society than I’ve discussed here. Not only is it a key for evangelism, it’s also crucial for discipling and counseling, as David Powlison has shown in his many writings on the subject. (See his essay “Idols of the Heart and Vanity Fair.”) The Dutch Calvinists have also shown that the best way to analyze cultures is by identifying their corporate idols. Indeed, each field of vocation and study has its reigning idols, as do political parties and ideologies. While secular societies have made an idol of human reason and human autonomy, other more traditional societies make idols of the family or racial purity. Stephen Metcalf, in his New York Times review of the memoir, called Weillʼs quote “ʻextraordinary.ʼ” This is testimony to how penetrating the concept of idolatry is to postmodern people.